I’ve been using headlamps for years, going way back to the early ’90s when I was briefly into caving in Arkansas. The earliest headlamps were mounted to helmets for miners (and sometimes contained explosive kerosene). By the time I came along, size had been reduced from neck-wrenching to merely cumbersome (my first incandescent model took four AA batteries and required more of a head net than a band). Headlamps for fishing should do a few things well: (1) they need to throw enough light to see the trail in front of you; (2) they need to be compatible with hats, (3) they need to be light and long-lasting, and (4) they need to not spook fish. The degree to which current headlamps attain this varies greatly. 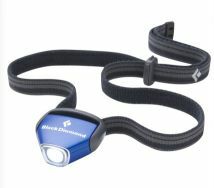 Recently the advent of LED lighting technology has drastically improved everything about headlamps. Six or eight years ago, the top of the line Petzl Tikka (above) took three AAAs and ran for around 24 hours straight, putting out a modest blue-white glow (technically, not really a beam). I believe I paid over $40 for my first Tikka. Four years ago I switched to a Black Diamond Ion (right), although my model is an older design than the present one. The Ion is way lighter, lasts about 30-40 hours on a camera battery (which costs about $6 to replace), and cost only $20 new. I really like the way the Ion can be perched on the end of a hat brim and aimed straight down for tying on flies. But the best deal I’ve seen on the market lately comes from humble Energizer. 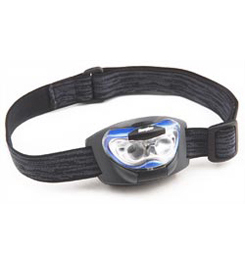 The Head Beam (left) headlamp is widely available in camping stores and even Wal-Mart. Most models (there are several) cost between $12 and $25. The model I bought has a four-LED mode which broadcasts a general glow, as well as a high-beam mode that puts a central spotlight in front of you. If you’re into hunting kangaroos at night, there’s a setting that turns on all five lights for a real floodbeam effect. Best of all, the light has a “red” mode which puts out a soft red light, which I have been told by several game biologists is less likely to alarm fish. The Head Beam has the same kind of soft strappy webbing as my Petzl and Black Diamond models, is lightweight, and takes (of course) three AAA batteries (Energizers, one would assume). Know of a better solution for throwing light in your path at night? Share it in the comments section!